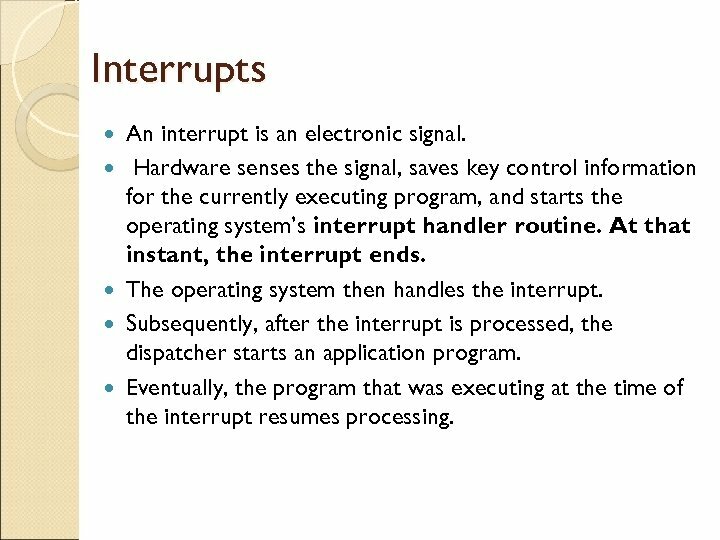 Interrupts An interrupt is an electronic signal. 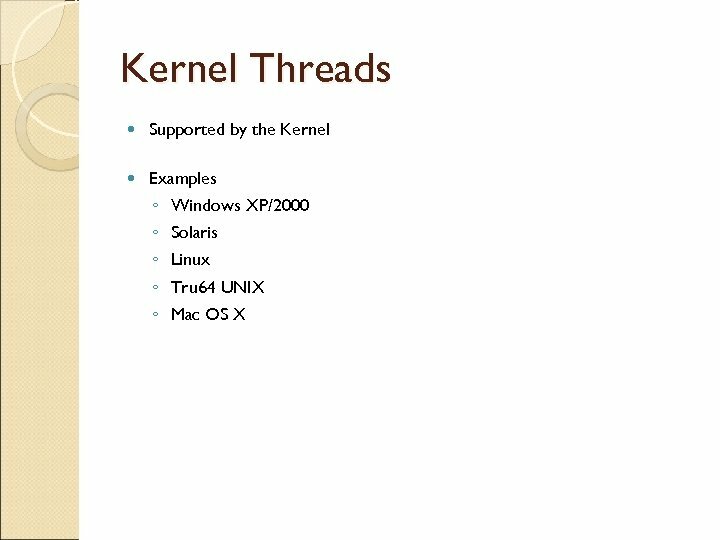 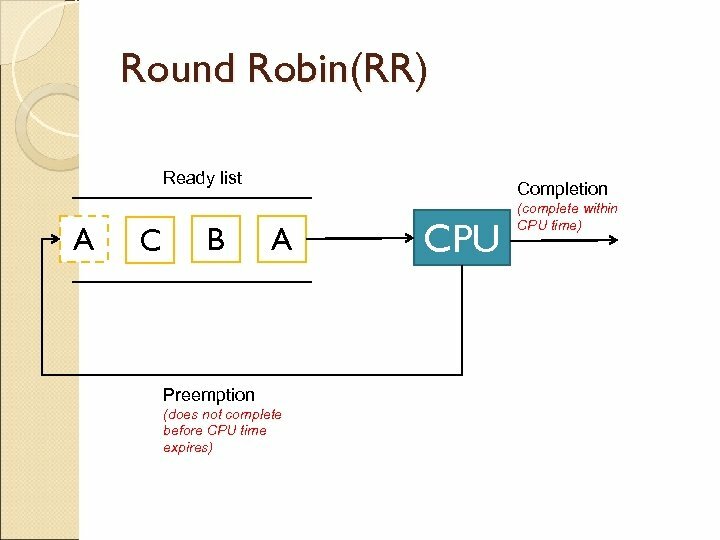 Hardware senses the signal, saves key control information for the currently executing program, and starts the operating system’s interrupt handler routine. 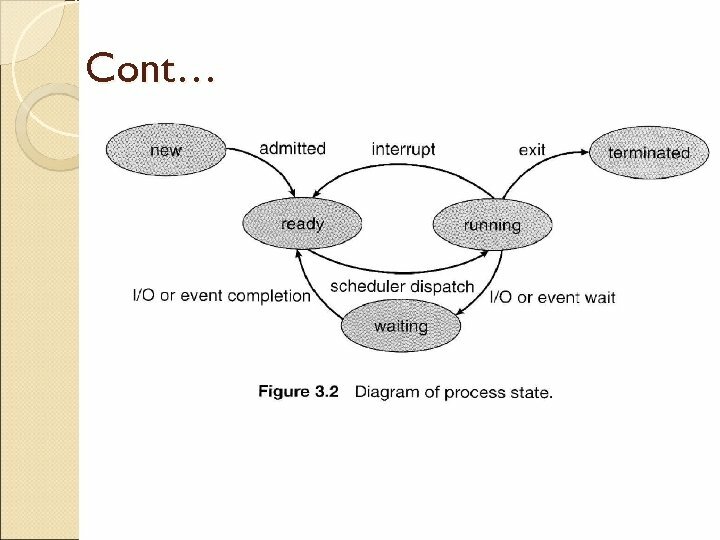 At that instant, the interrupt ends. 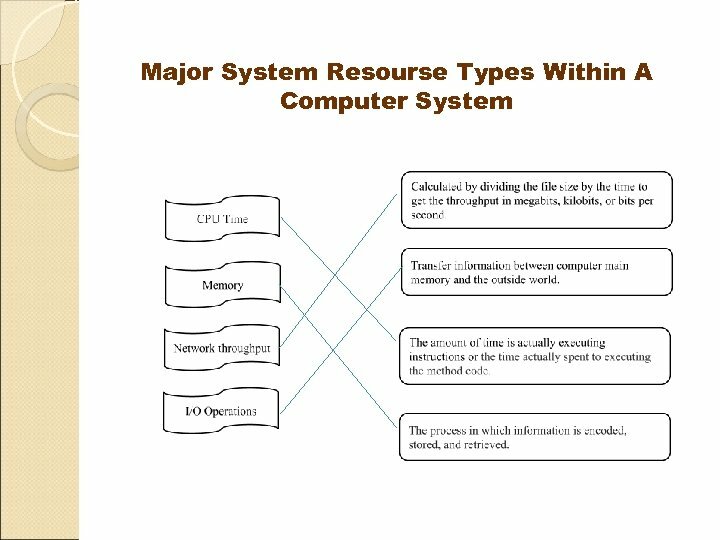 The operating system then handles the interrupt. 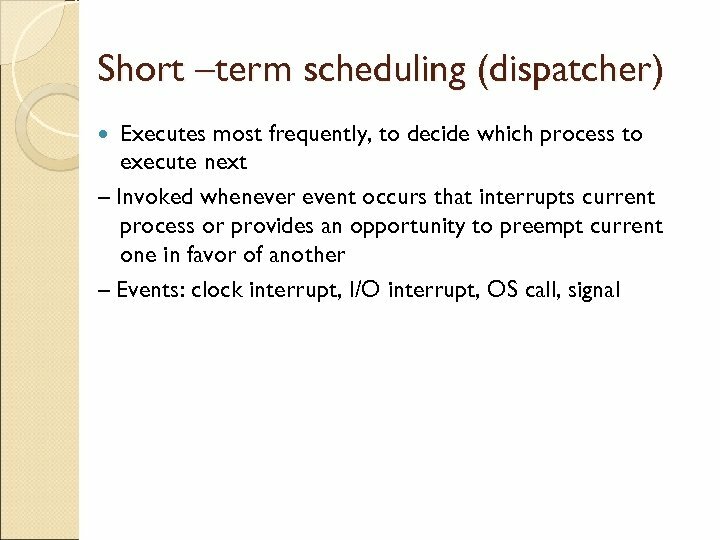 Subsequently, after the interrupt is processed, the dispatcher starts an application program. 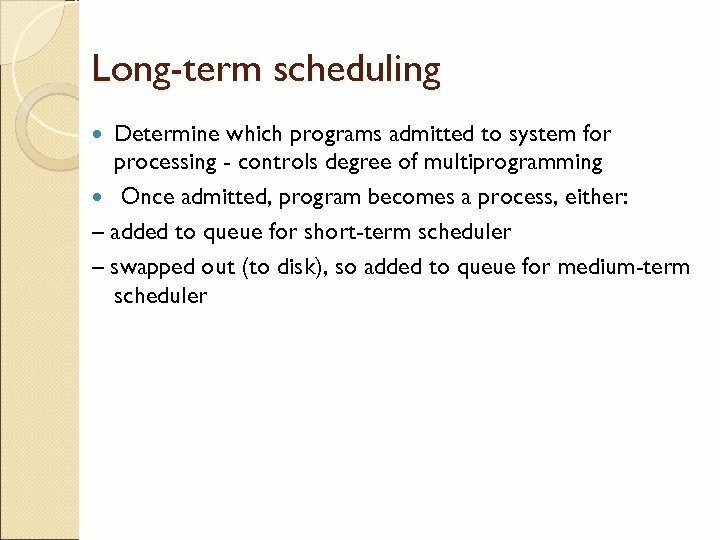 Eventually, the program that was executing at the time of the interrupt resumes processing. 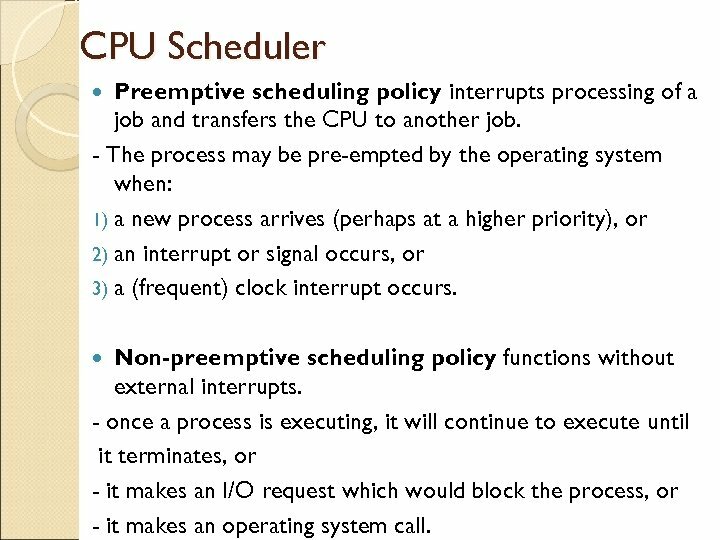 CPU Scheduler Preemptive scheduling policy interrupts processing of a job and transfers the CPU to another job. 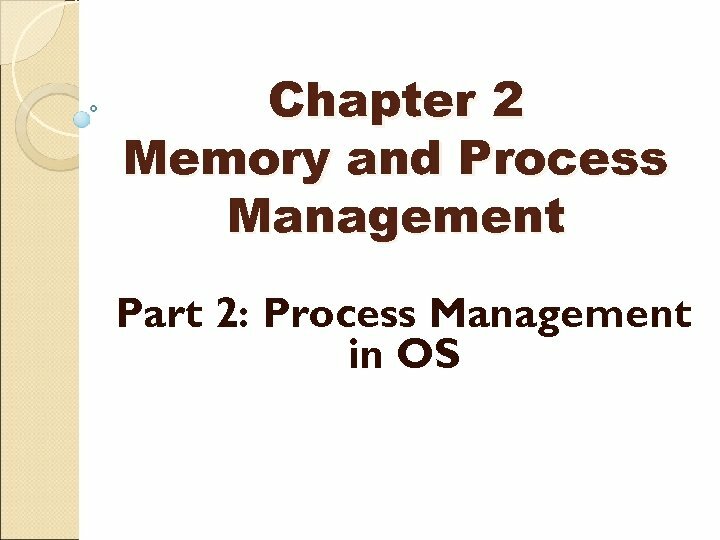 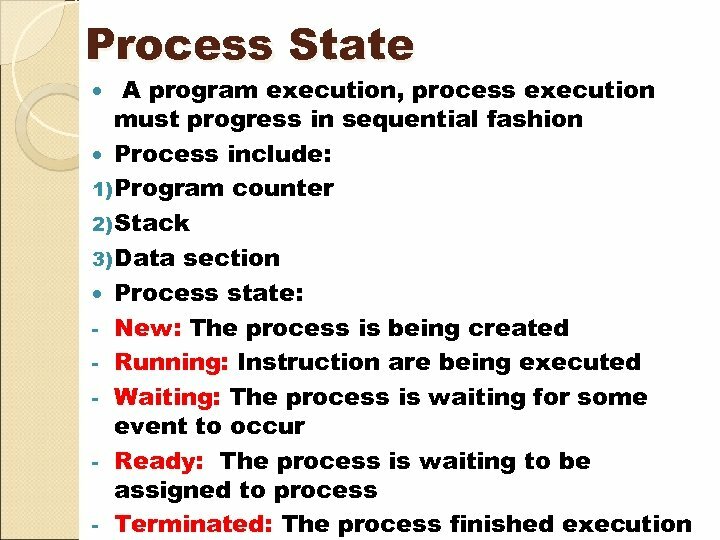 - The process may be pre-empted by the operating system when: 1) a new process arrives (perhaps at a higher priority), or 2) an interrupt or signal occurs, or 3) a (frequent) clock interrupt occurs. 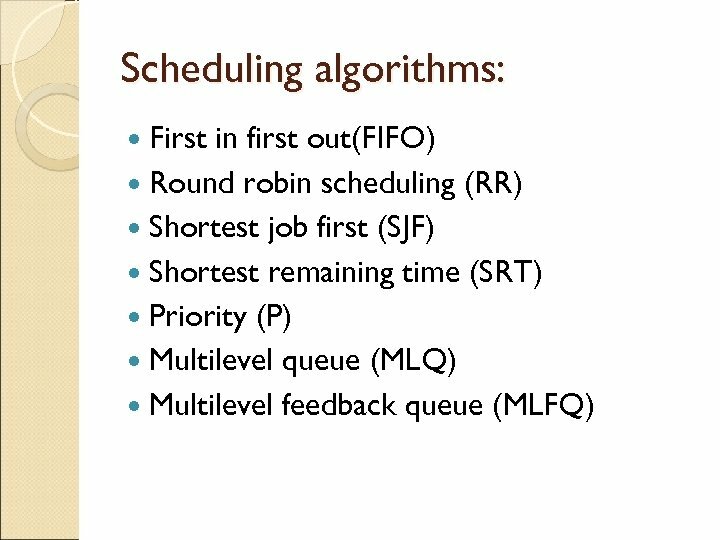 Non-preemptive scheduling policy functions without external interrupts. 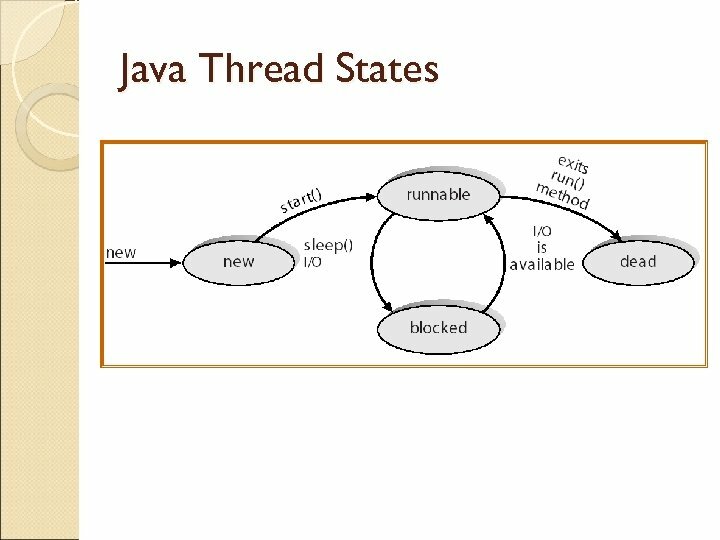 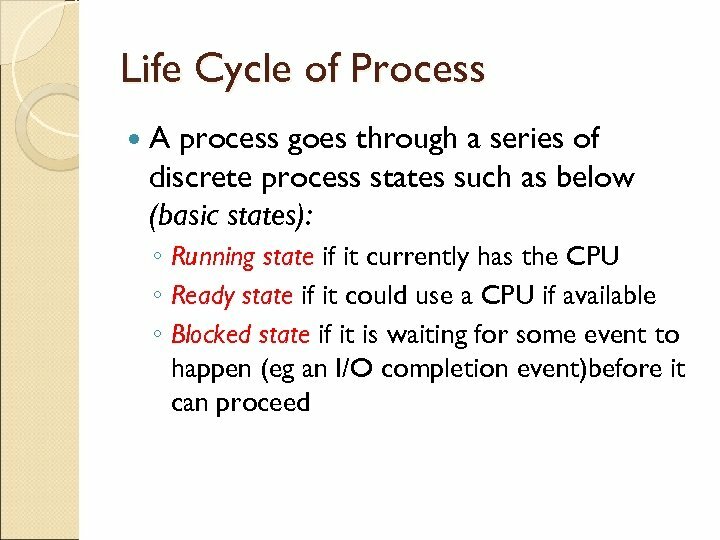 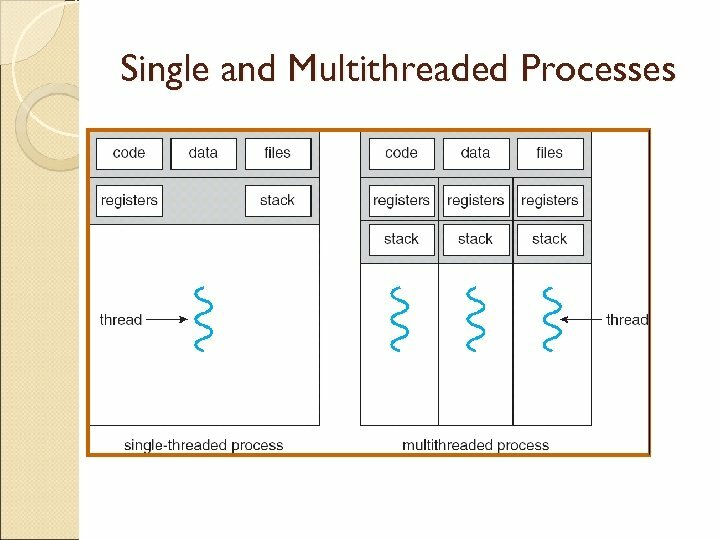 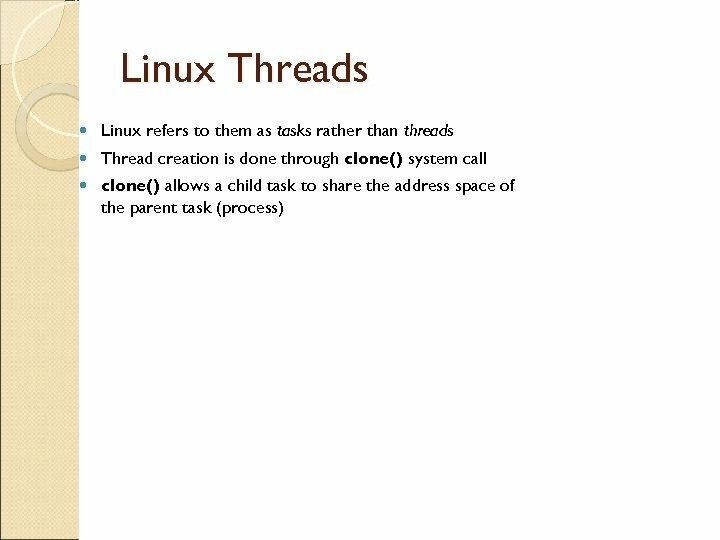 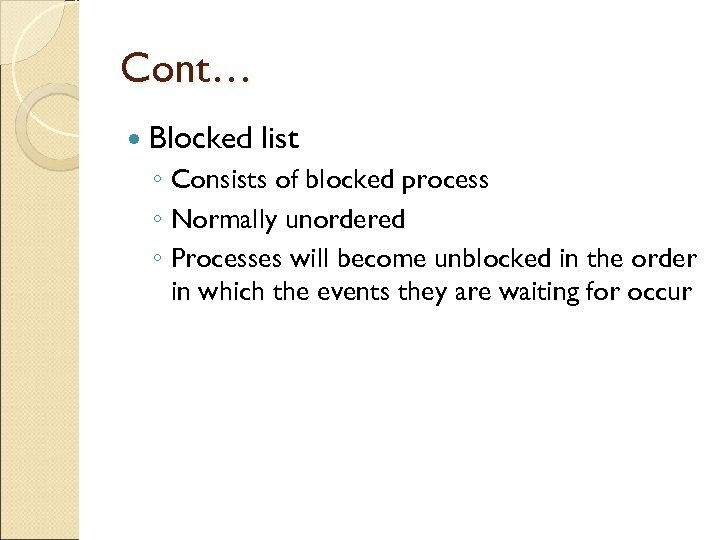 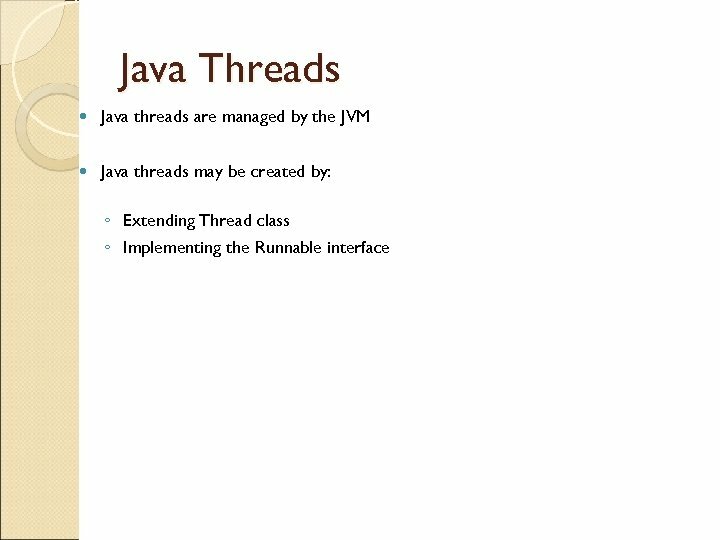 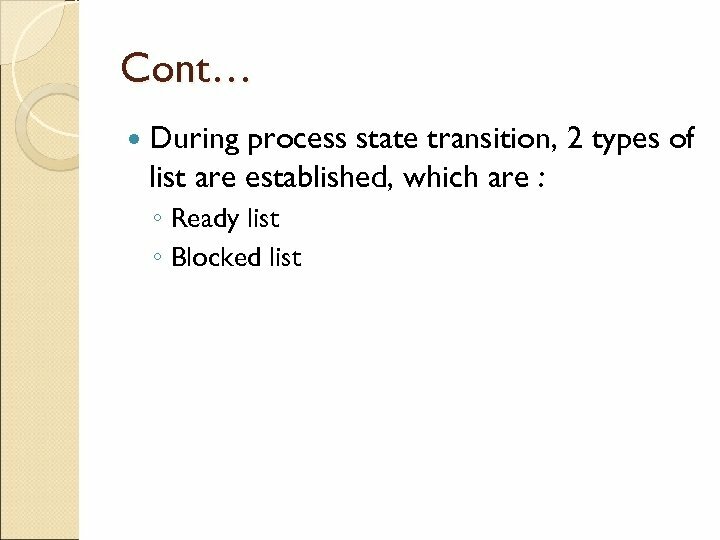 - once a process is executing, it will continue to execute until it terminates, or - it makes an I/O request which would block the process, or - it makes an operating system call. 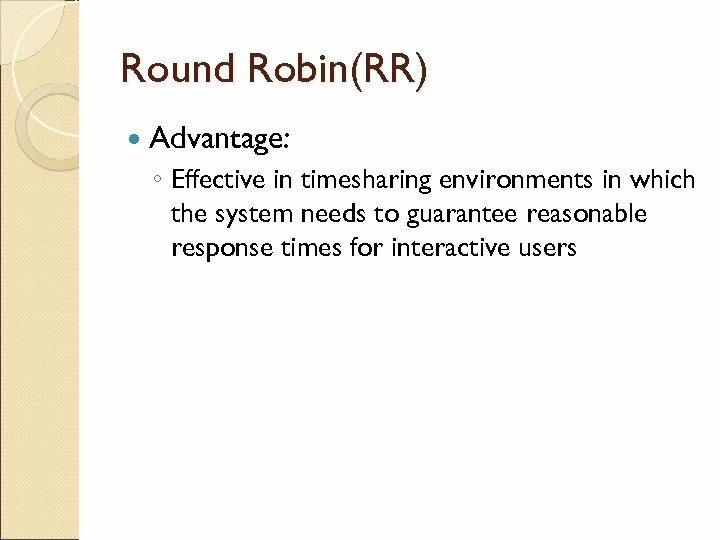 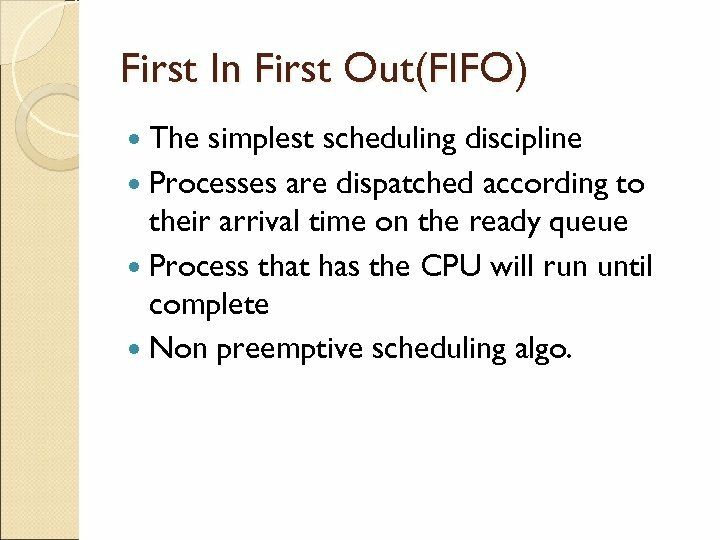 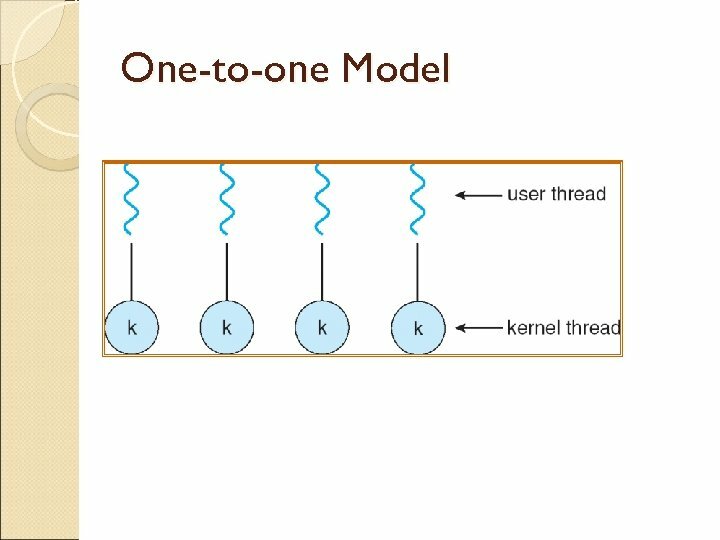 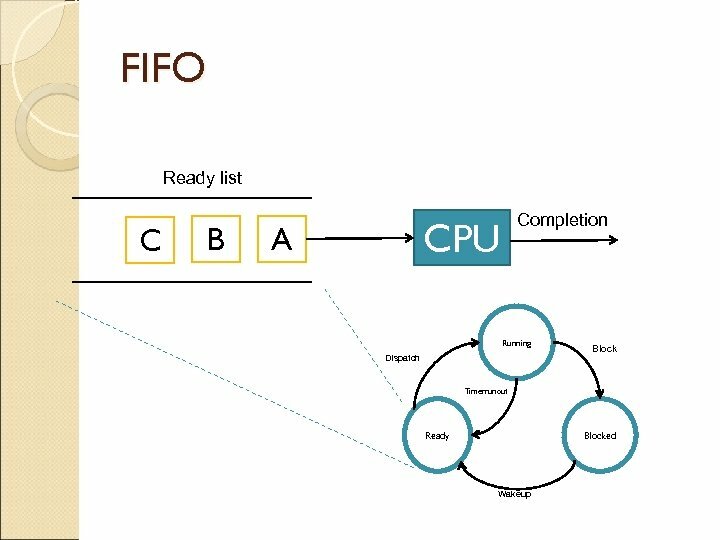 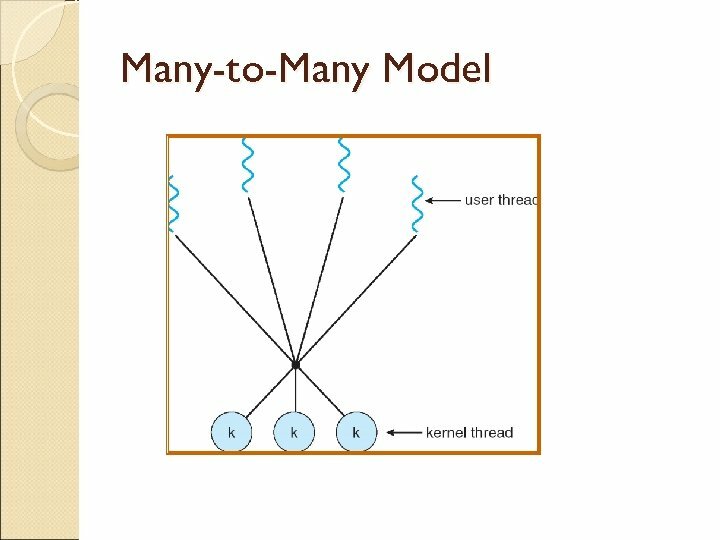 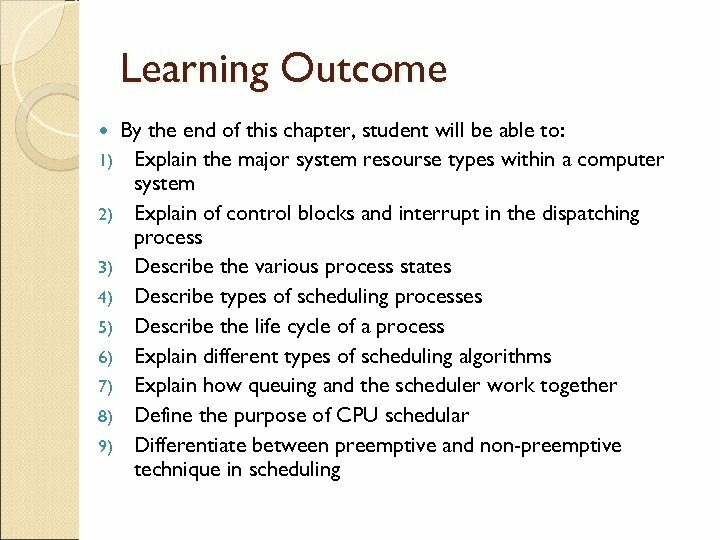 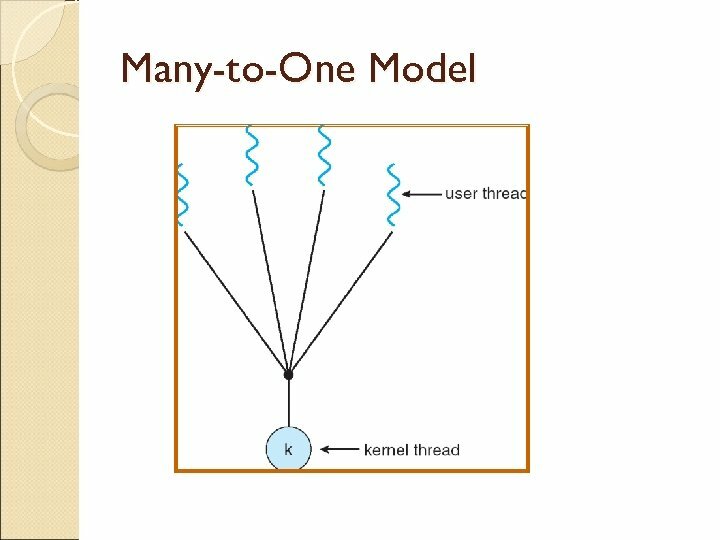 First In First Out(FIFO) The simplest scheduling discipline Processes are dispatched according to their arrival time on the ready queue Process that has the CPU will run until complete Non preemptive scheduling algo. 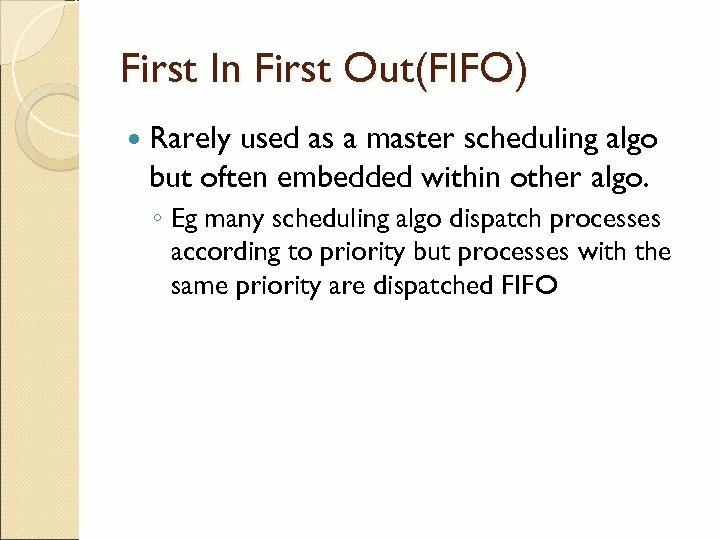 First Come First Serve (FIFO) Non-preemptive. 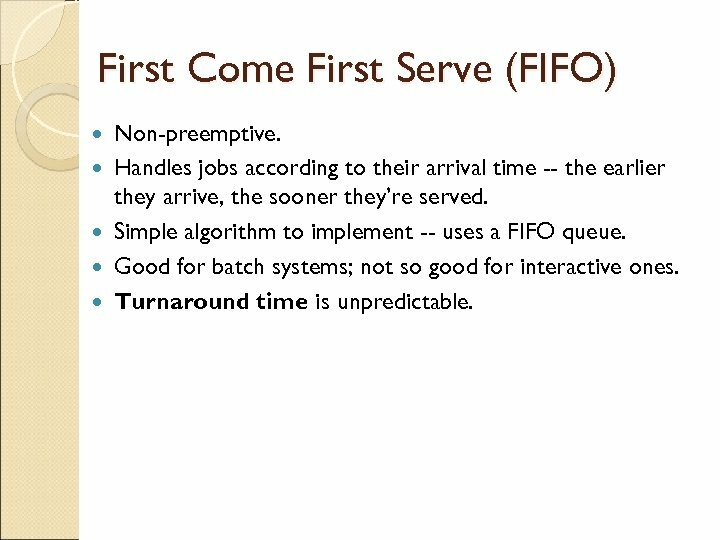 Handles jobs according to their arrival time -- the earlier they arrive, the sooner they’re served. 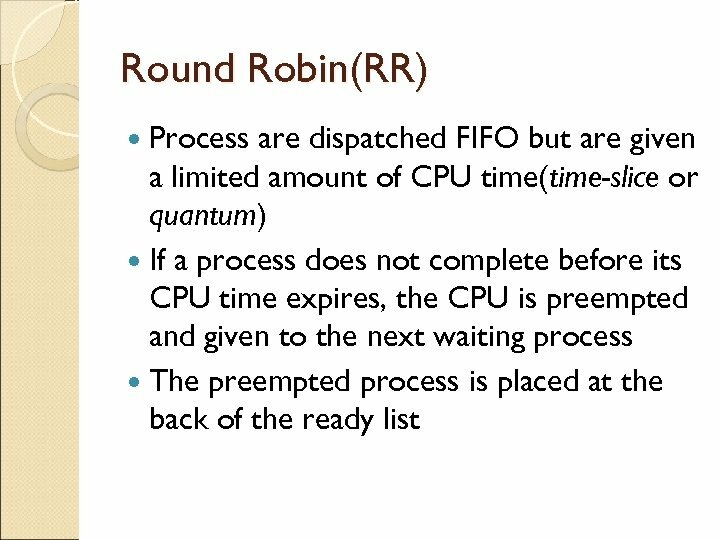 Simple algorithm to implement -- uses a FIFO queue. 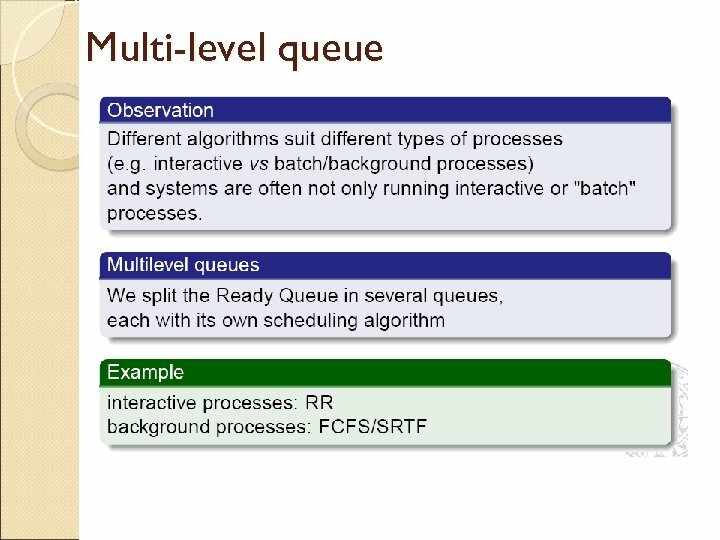 Good for batch systems; not so good for interactive ones. 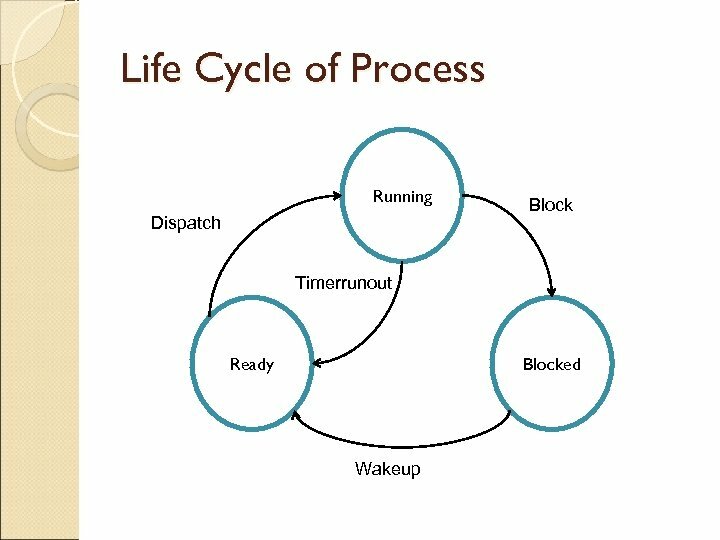 Turnaround time is unpredictable. 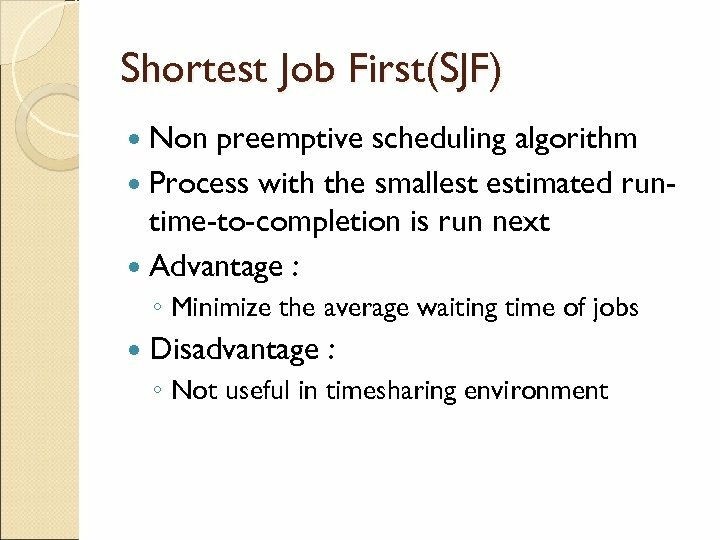 Shortest Job First (SJF) Non-preemptive. 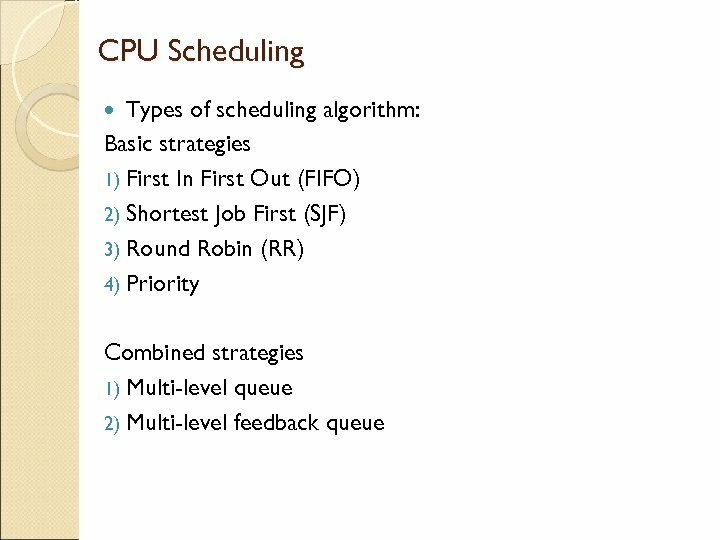 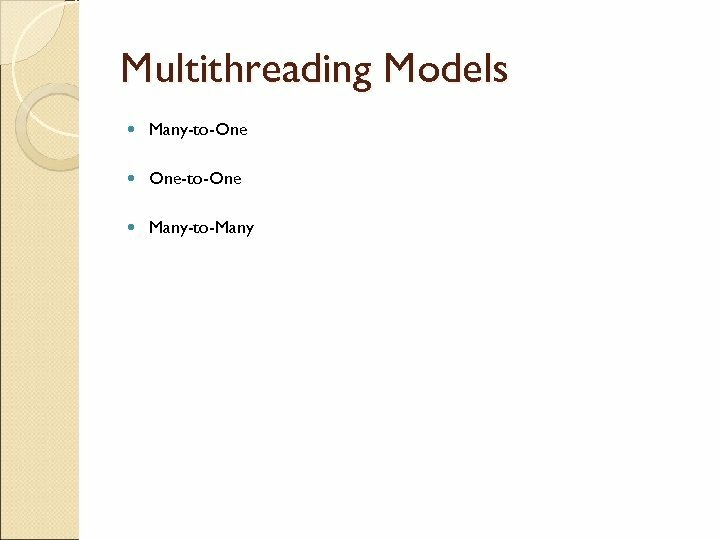 Handles jobs based on length of their CPU cycle time. 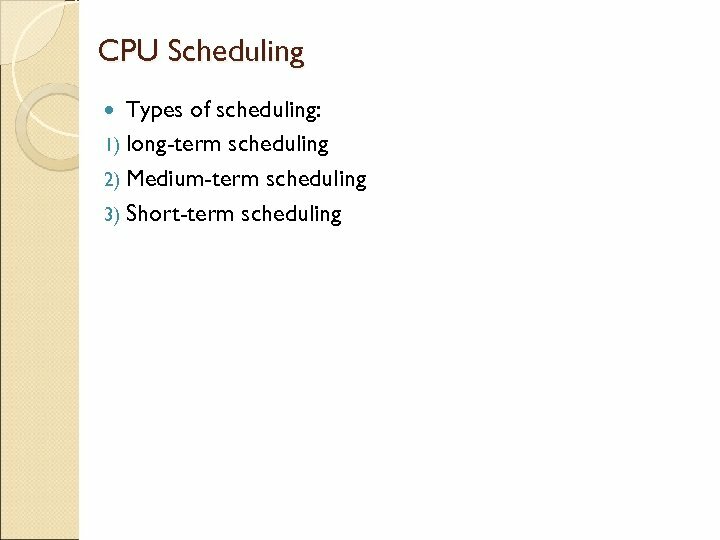 ◦ Use lengths to schedule process with shortest time. 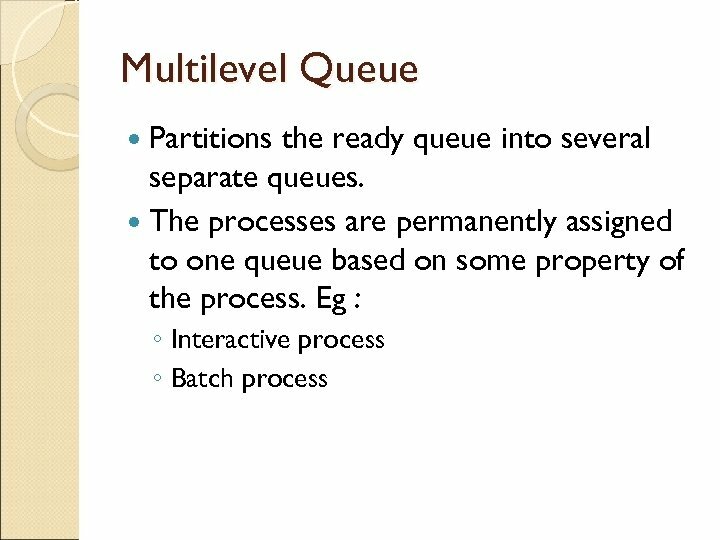 Optimal – gives minimum average waiting time for a given set of processes. 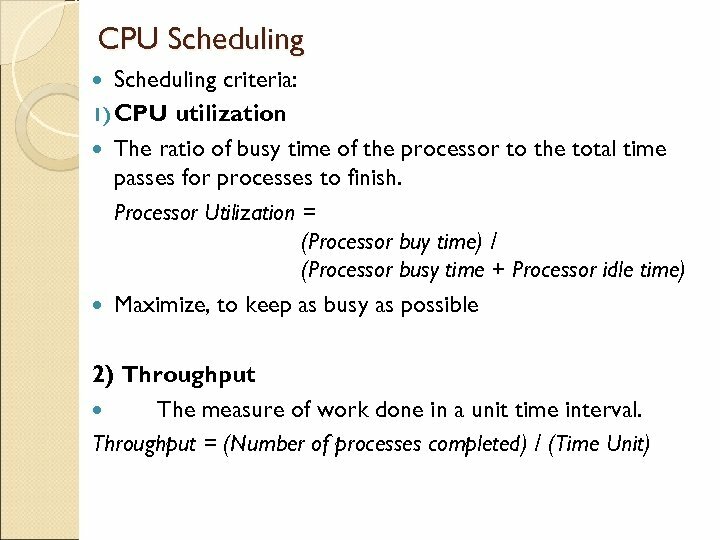 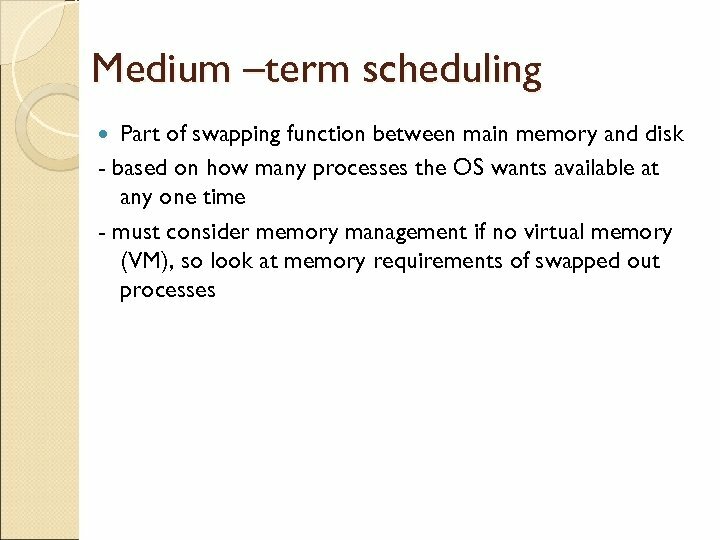 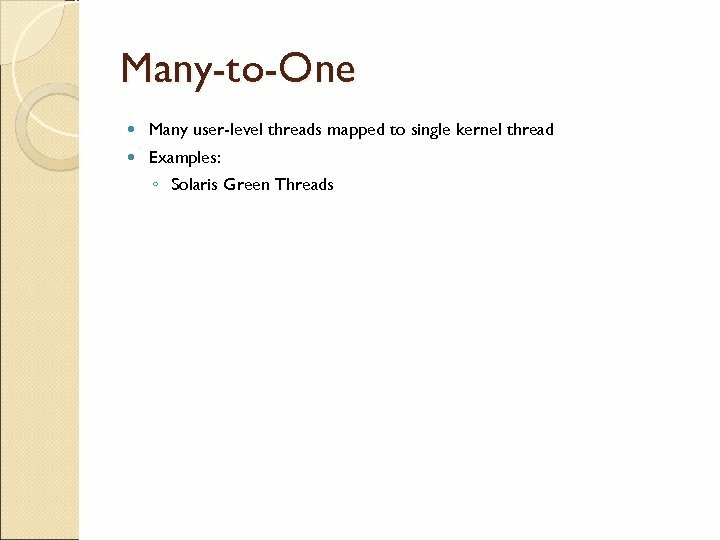 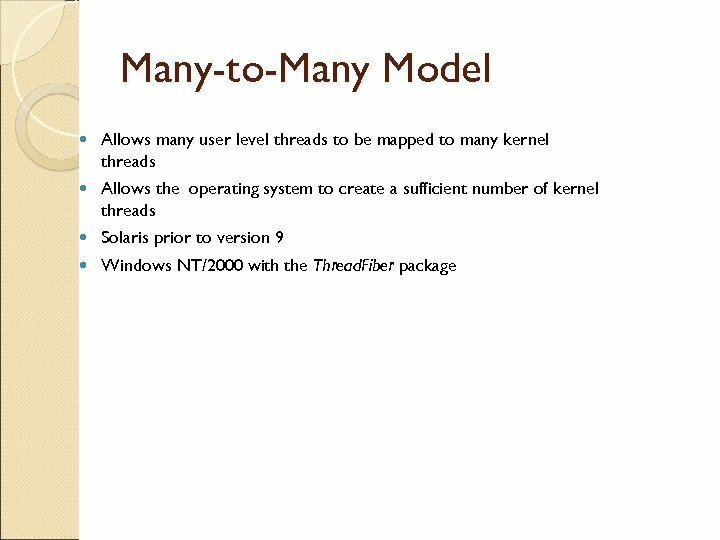 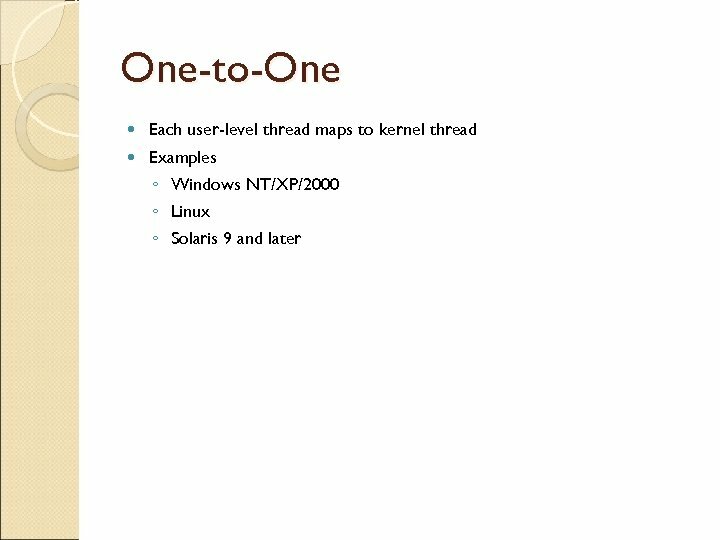 ◦ optimal only when all of jobs are available at same time and the CPU estimates are available and accurate. 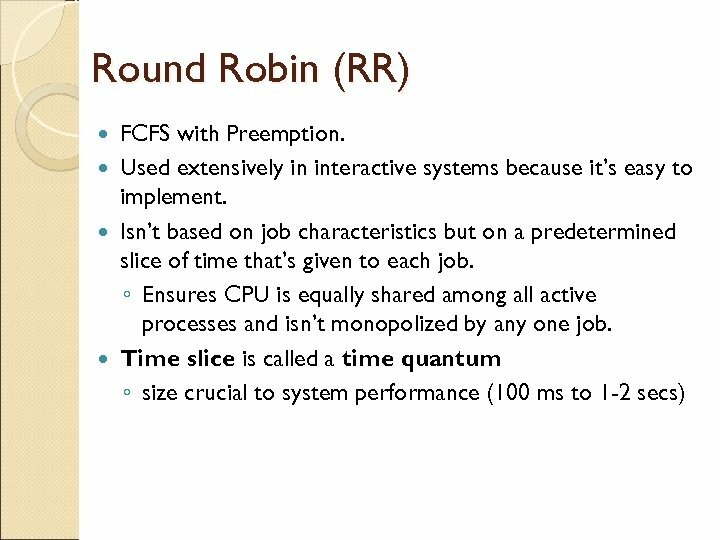 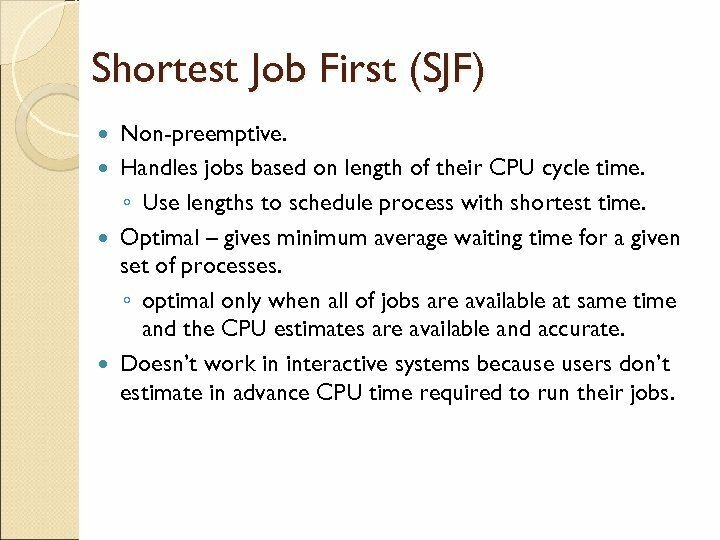 Doesn’t work in interactive systems because users don’t estimate in advance CPU time required to run their jobs. 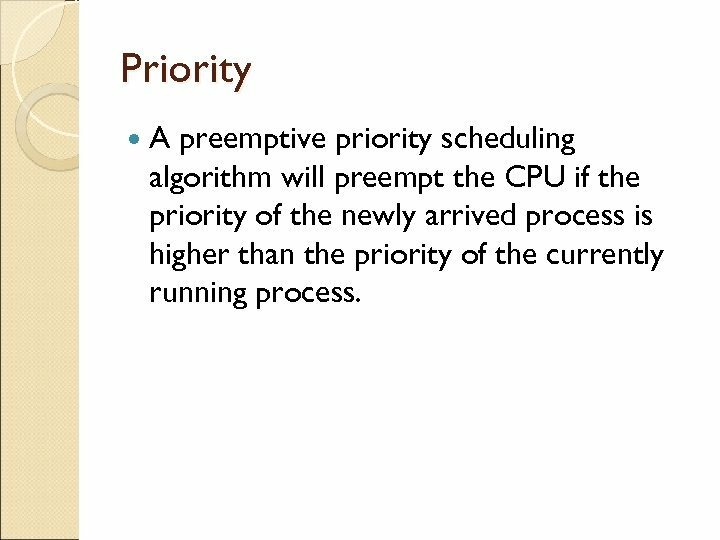 Priority scheduling Non-preemptive. 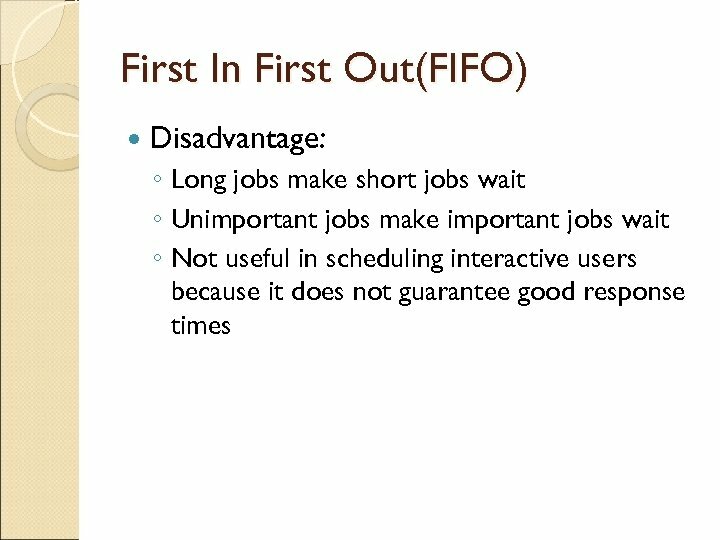 Gives preferential treatment to important jobs. 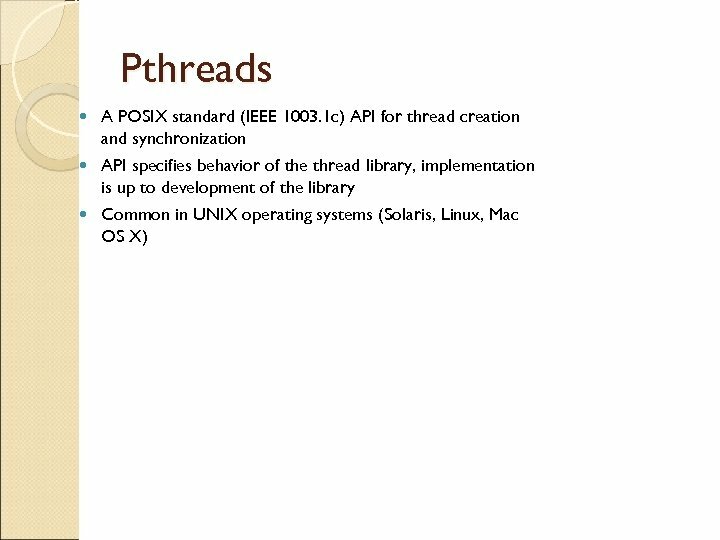 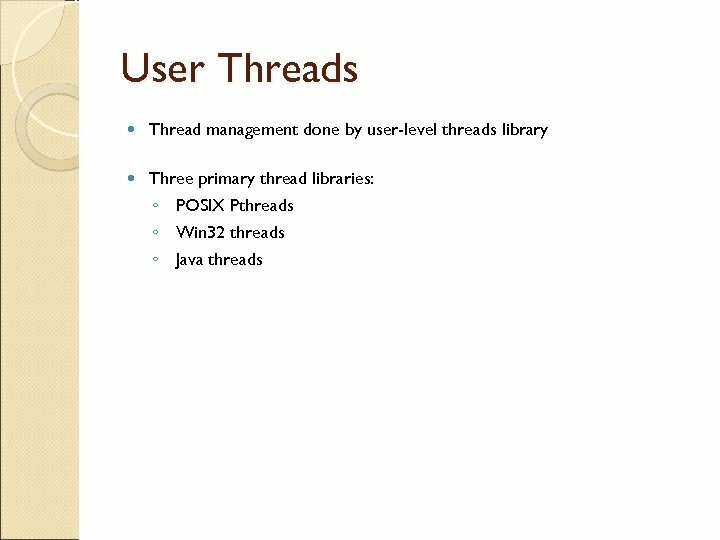 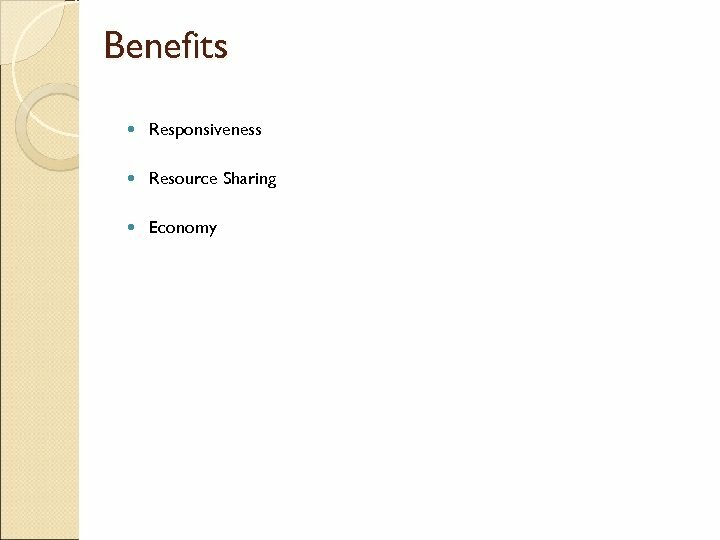 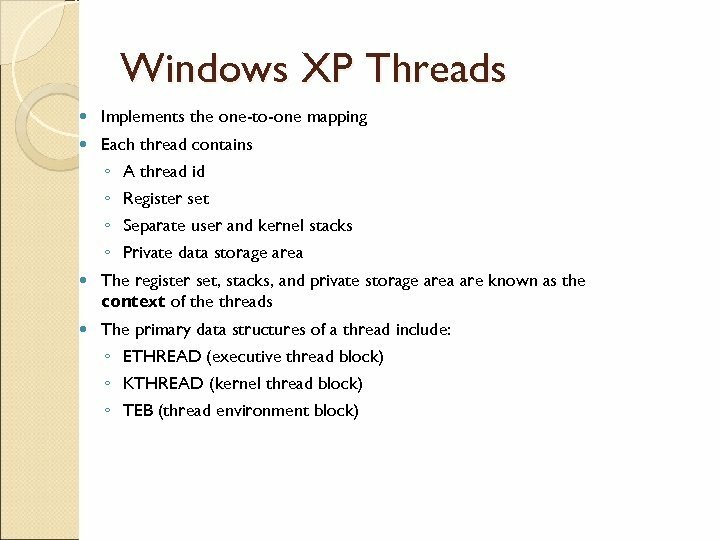 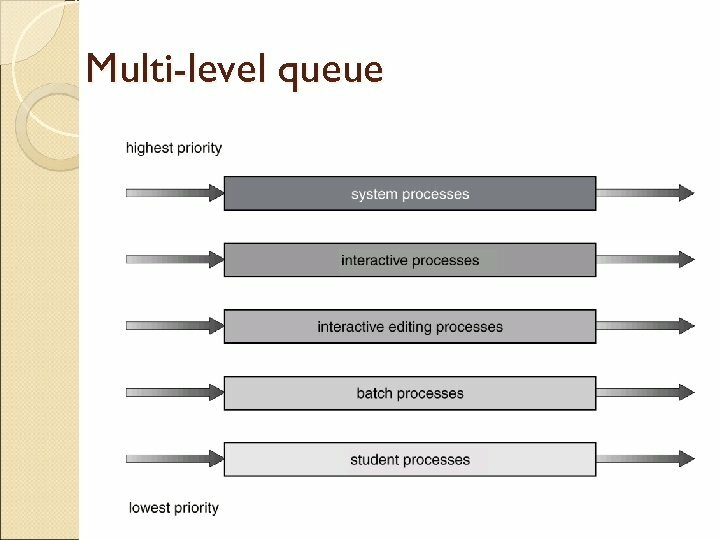 ◦ Programs with highest priority are processed first. 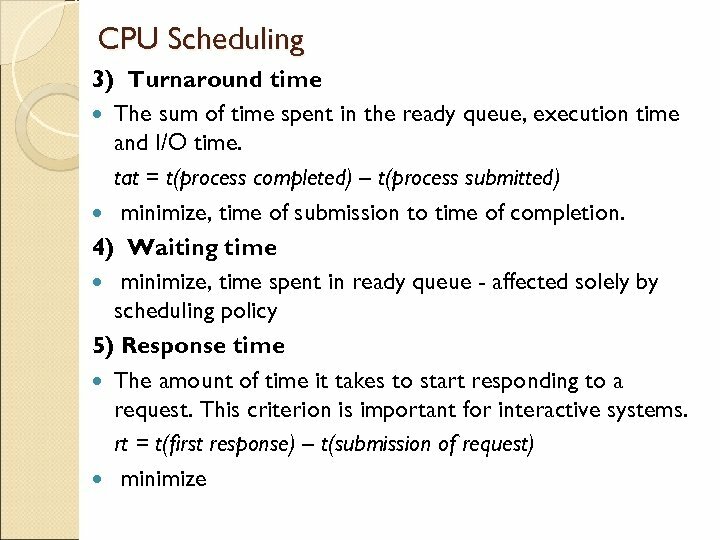 ◦ Aren’t interrupted until CPU cycles are completed or a natural wait occurs. 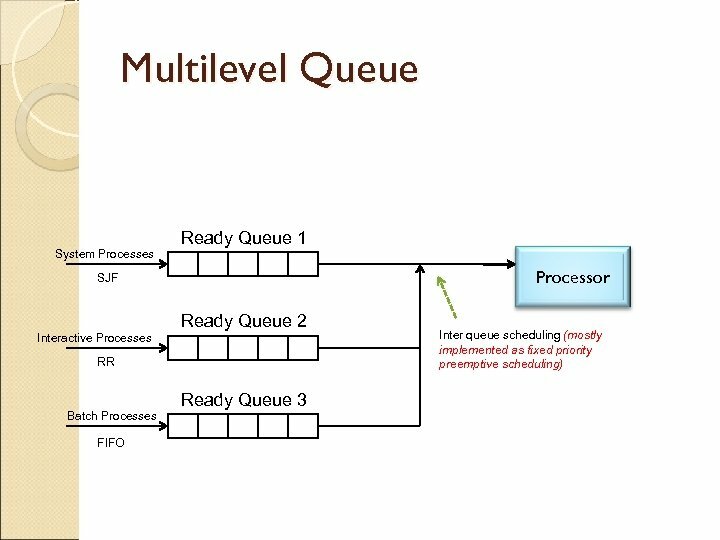 If 2+ jobs with equal priority are in READY queue, processor is allocated to one that arrived first (first come first served within priority). 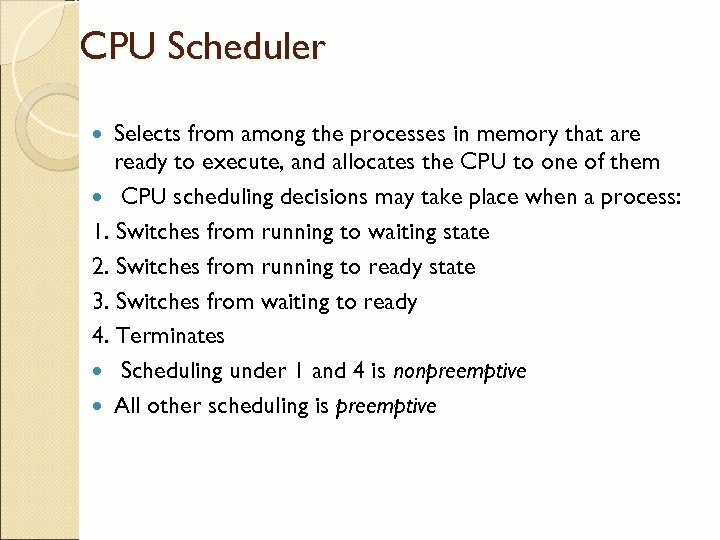 Many different methods of assigning priorities by system administrator or by Processor Manager. 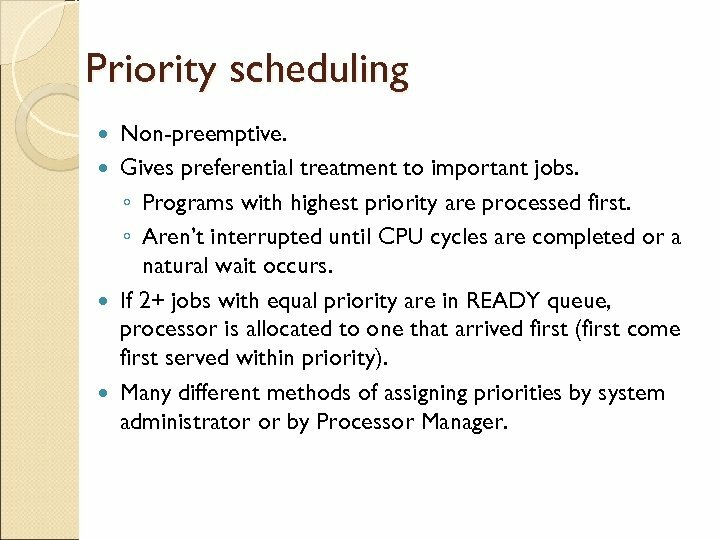 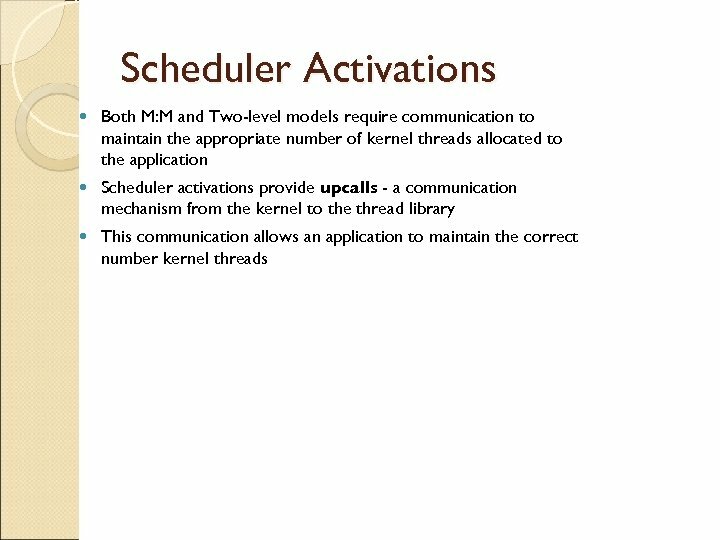 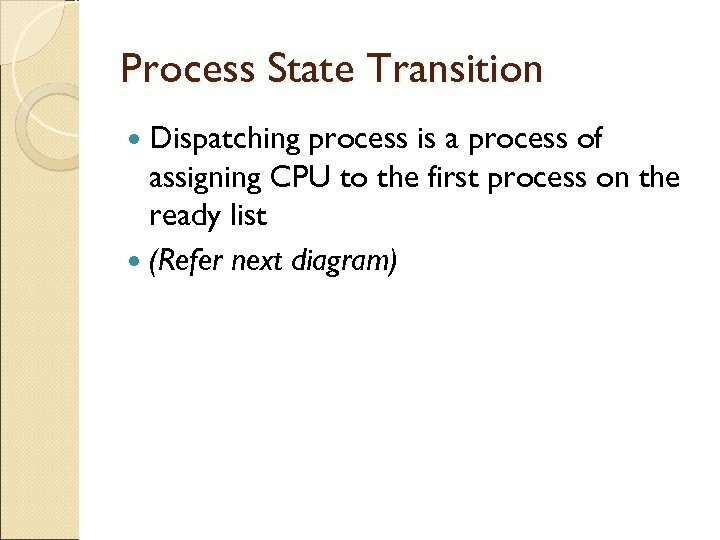 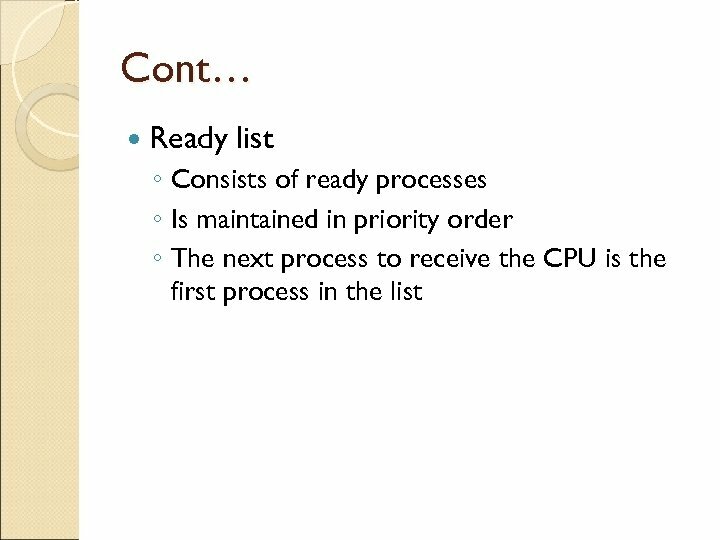 Priority A preemptive priority scheduling algorithm will preempt the CPU if the priority of the newly arrived process is higher than the priority of the currently running process. 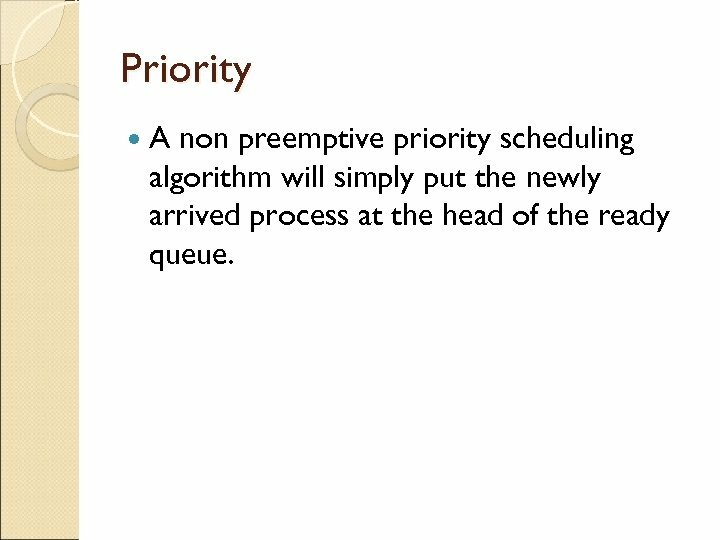 Priority A non preemptive priority scheduling algorithm will simply put the newly arrived process at the head of the ready queue. 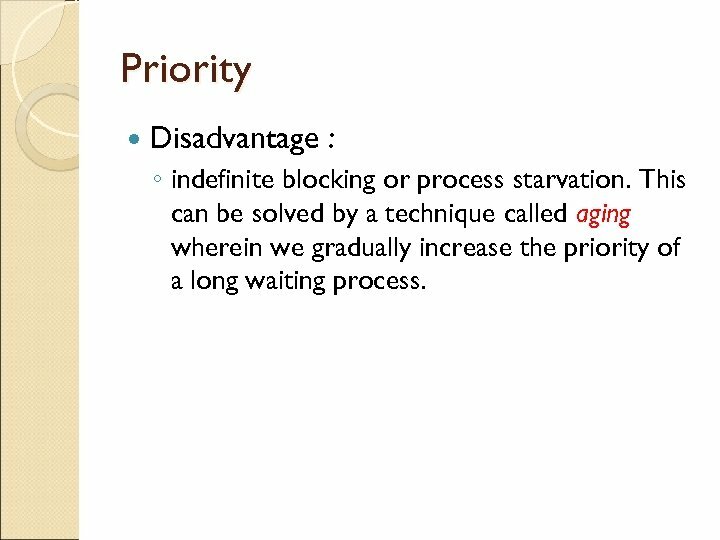 Priority Disadvantage : ◦ indefinite blocking or process starvation. 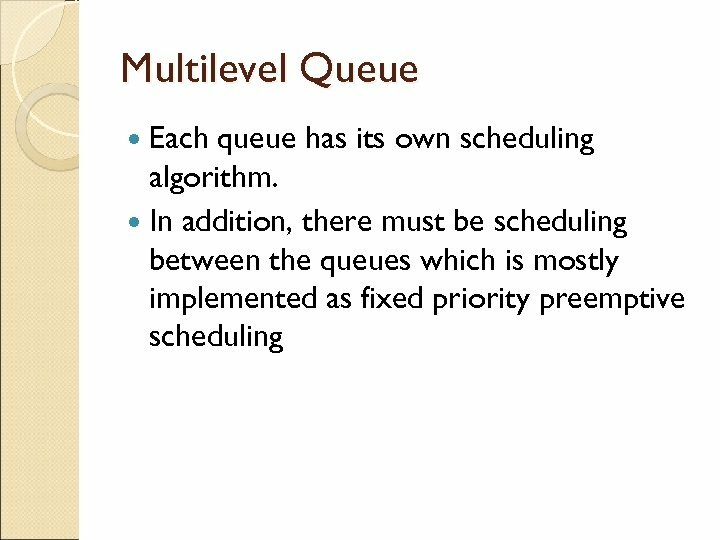 This can be solved by a technique called aging wherein we gradually increase the priority of a long waiting process. 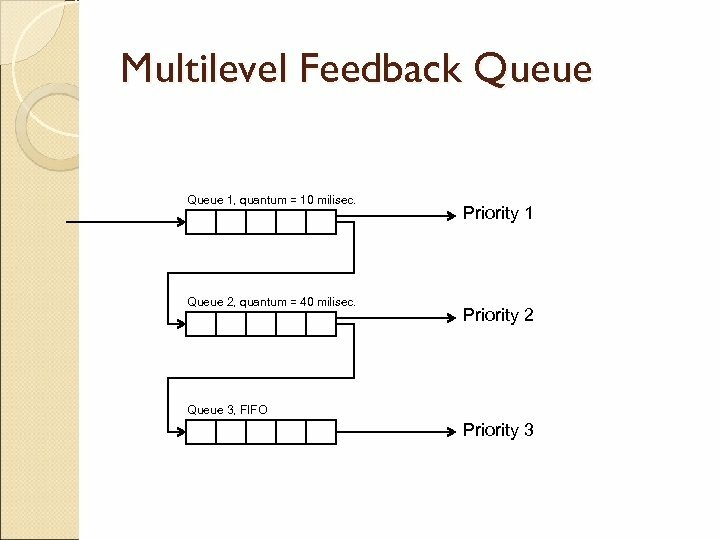 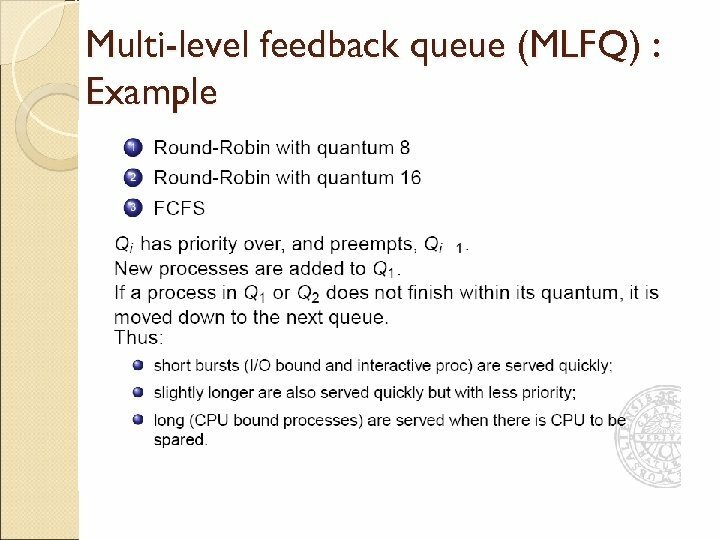 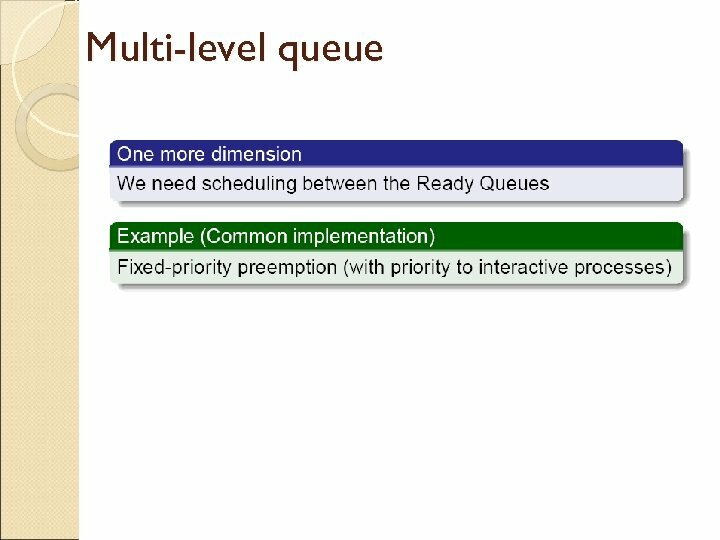 Multilevel Feedback Queue (MLFQ) Has a number of queues, each assigned a different priority level. 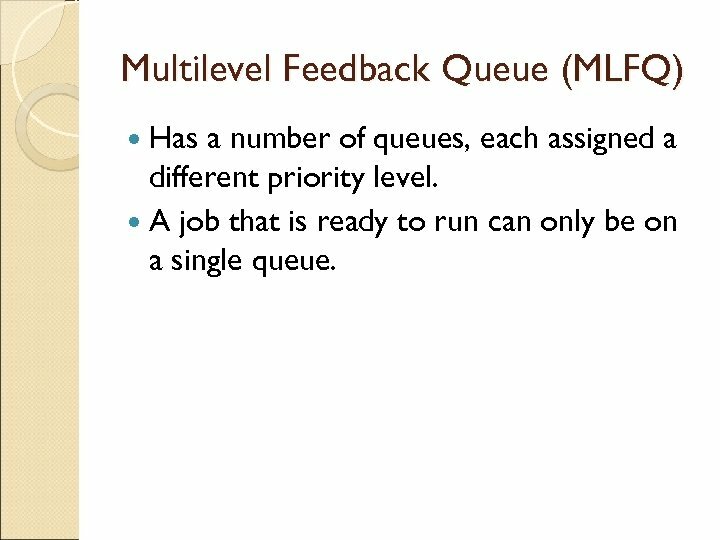 A job that is ready to run can only be on a single queue. 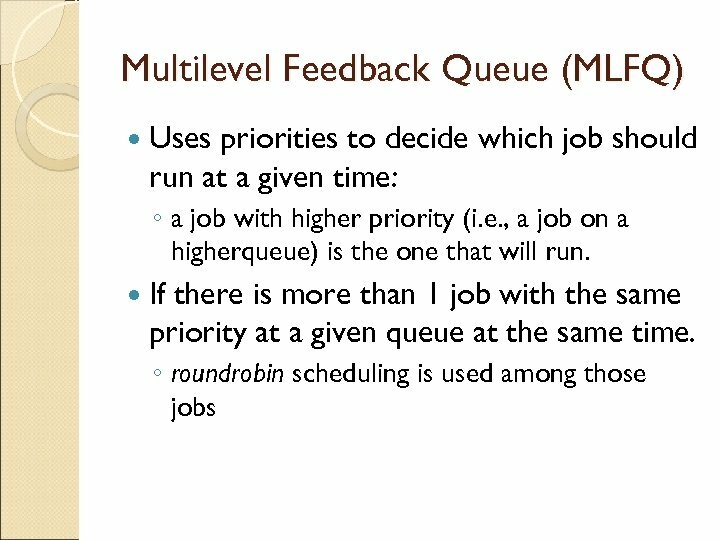 Multilevel Feedback Queue (MLFQ) MLFQ varies the priority of a job based on its observed behavior. 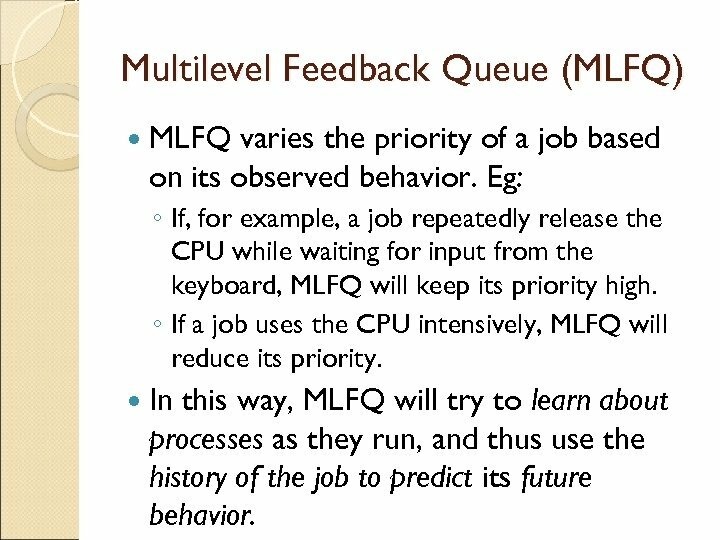 Eg: ◦ If, for example, a job repeatedly release the CPU while waiting for input from the keyboard, MLFQ will keep its priority high. 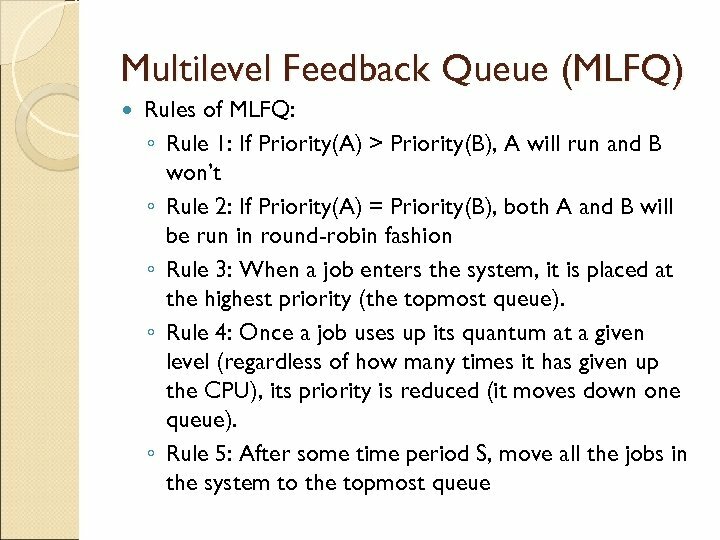 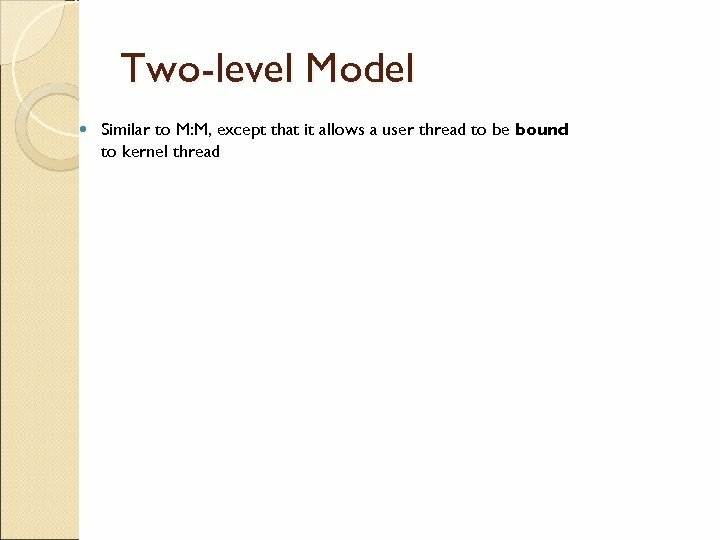 ◦ If a job uses the CPU intensively, MLFQ will reduce its priority. 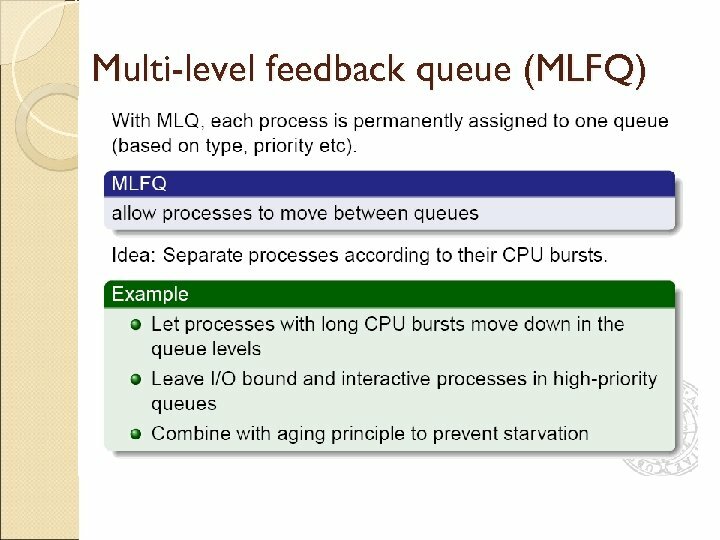 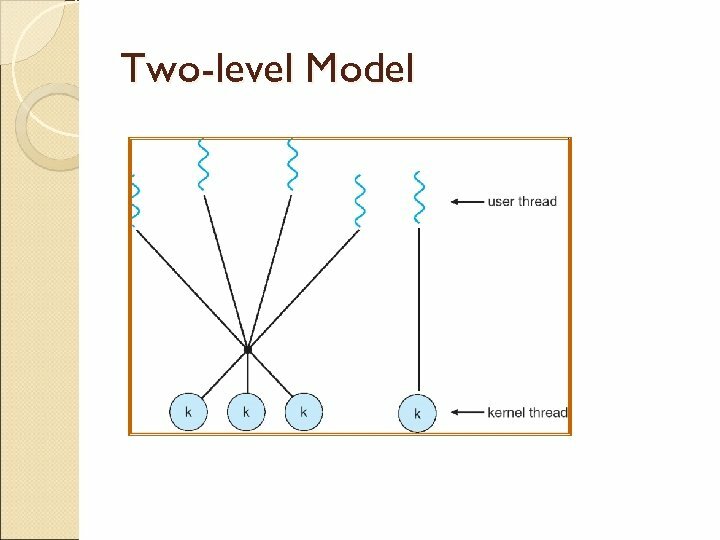 In this way, MLFQ will try to learn about processes as they run, and thus use the history of the job to predict its future behavior.